The floods have gone down and we are able to move around again. The river still has a bit of a flow on it but not too much. Richard and family visited today, so after lunch in the Talbot Inn (thanks Richard) we took a short trip up to Pinkhill Lock. Children seated “safely” on the roof we make steady progress up the river, to moor for a short picnic before the rain started. 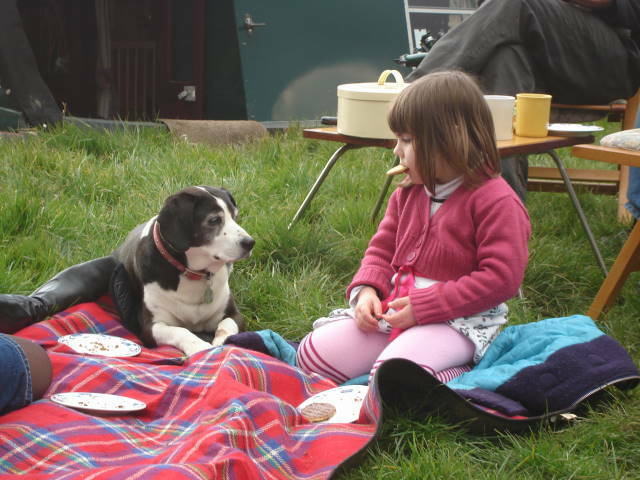 Pippy and Catherine have a stand-off over a biscuit, although Catherine seemed to have the upper hand. Richard and I then went back to get the car and taking a road marked no unauthorised access expecting to end up at the lock, we found oursleves on a parallel road around Farmoor Reservoir – but we got there in the end. The only way ashore is to walk a plank and hope you don’t fall off. Left the hire boats at Mapledurham and got a lift back to our boat Sunday evening. The river is up about 2-3 ft at Eynsham, the water now level with the bank. 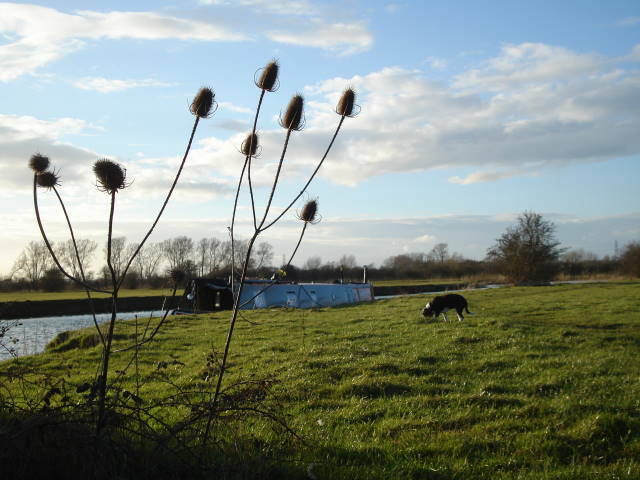 Settling back in to work for the next 3 days before we start at the boat yard – if the water goes down and the hire boats can go out for Easter. Lots to juggle at the moment but survial takes priority this morning, making sure the boat is safe and secure. We made it to Reading last night. Strong stream through the centre of Reading, bit like riding a log flume. Managed moor up at Tescos for the evening. Set off early hoping to get a good start. 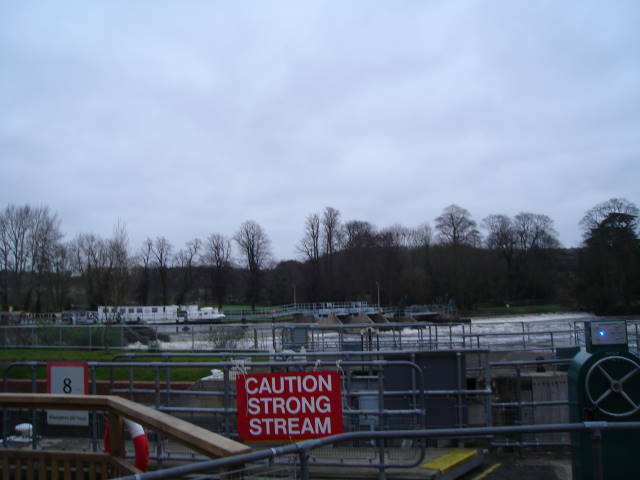 But on reaching MapleDurham lock (near TileHurst) we find the Thames is going into Flood. So moored above the lock and don’t know when we’ll be able to move again. The only bit of boating I had done before my baptism of fire was a summer job cleaning gin palaces and the odd cup of coffee aboard Daniel Oakley. 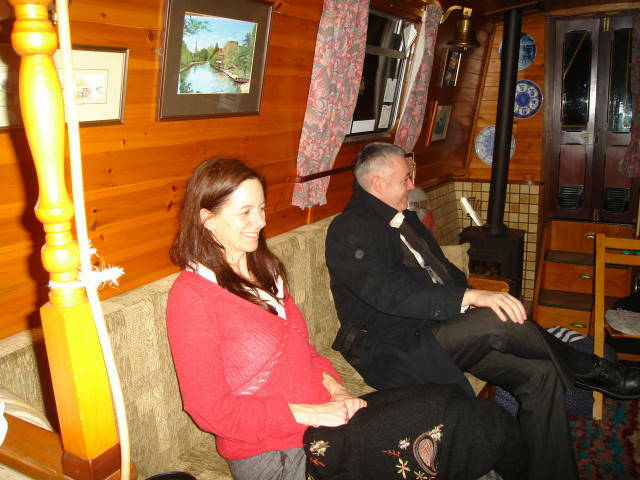 So when Karen asked if we fancied moving a boat for Anglo Welsh I jumped at the chance with my partner Nik (he has prior experience!). So full to the brim with excitement we met Karen and Paul and jumped aboard “Faith”. She is a wide beam, not very long but very tall with a cruiser back. The first night felt a little like camping as we opted to sleep on the twin beds and our dog Tye hopped up for a cuddle, a tad confused about why we seemed to be bumping about ( and not in the way you may think). 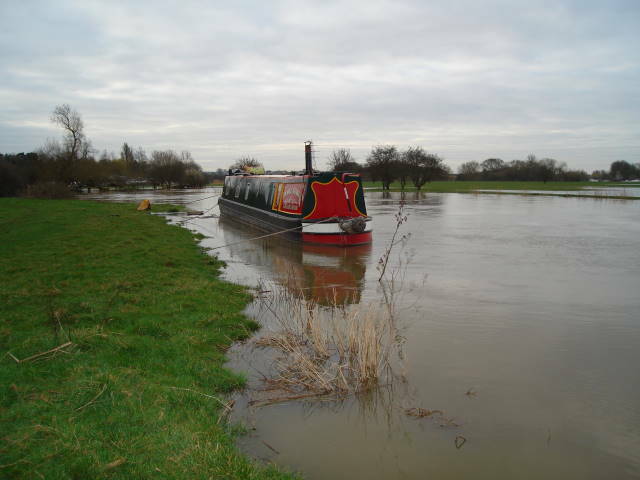 In all the weather was not on our side as we had 80mph winds, driving rain, and the Thames in flood! It took a few hairy moments and a bit of shouting to get the hang of the steering (Paul and Nik would argue that I never really got the hang of it but I think with more of a run on the Thames I would have got there). We found some fantastic watering holes and a pint of 6X costing £1.35 per pint. Some top eateries were also found and I can recommend the Tuesday night £9.95 curry in Devises. My very un-boat like nail extension’s saved my fingers from getting ripped off but did result in the need for an emergency trip to a nail bar in Reading. The others kept talking about the peace and tranquility of boating but after 90 odd locks gone through twice (we had to have two boats that wouldn’t fit in together didn’t we) in 4 days I was wondering where this peace was found! Paul had us up and on the go by 7.30 and we rarely stopped before 6 but all that said and I find myself sitting at my desk wishing I was doing all over again. I had a blast. Nik and I are already waiting for another boat move to come up and are putting together a plan for a boat of our own! 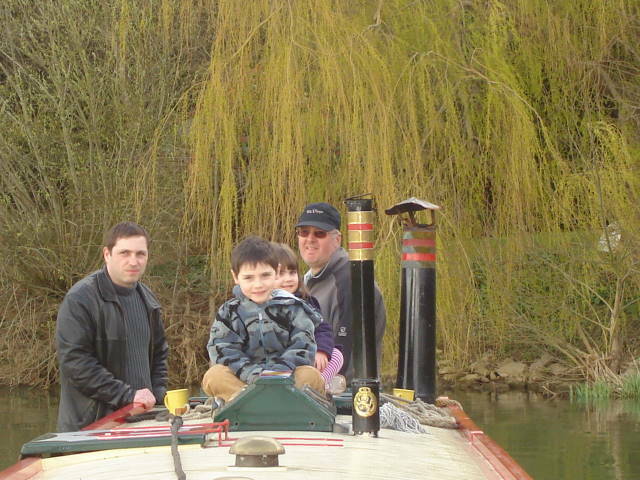 Although the Thames in flood put pay to our relaxing jaunt on the waterway I am sure the day will come when I get to explore that side to boating. I am ready, I have my captains hat, chief cook bobble hat and my own windless with wizzy handle (shame its not pink but a re-spray can be arranged). 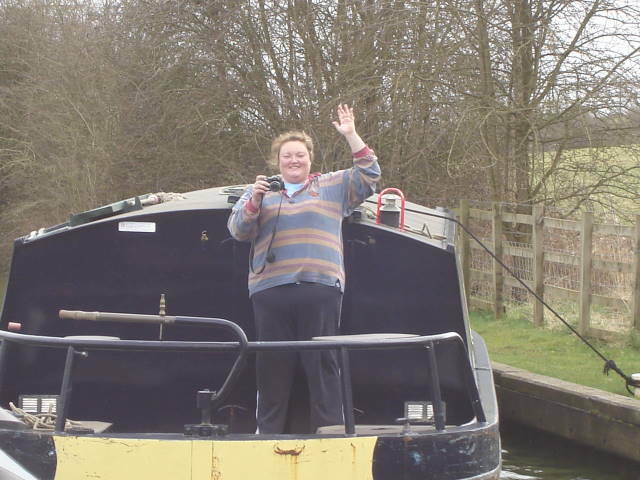 Next on my list is a proper narrow boat with a real stove to try so Barry, what have you got that needs moving????????????????? A big thanks to Karen, Paul and Pip for showing me how its done and their encouraging words of wisdom and thanks to Barry at Anglo for the opportunity that could change our lives forever! The wind got up at 1.30am. The boat started banging around and woke us up. That was it really for the rest of the night. Un-daunted there was a lull at 7.30 in the morning, so raring to go Nik encouraged us to make a start. Up three locks, with Gemma soon getting the hang of the steering. The weather was quite nice, sun shine and almost no wind. 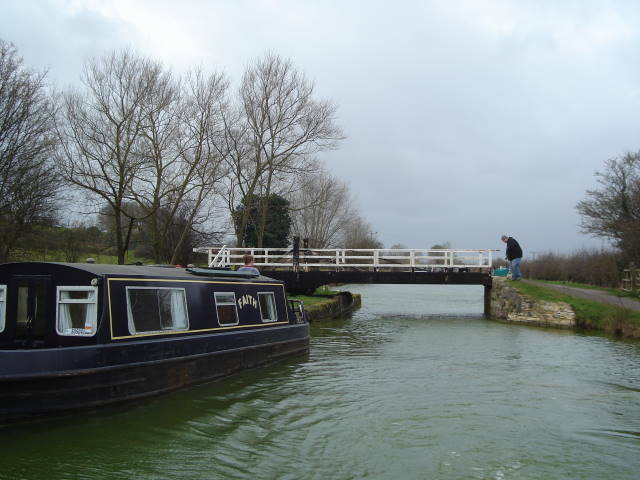 We were delayed at Seend Top Lock. A boat had broken free of its moorings and blocked the top gate. 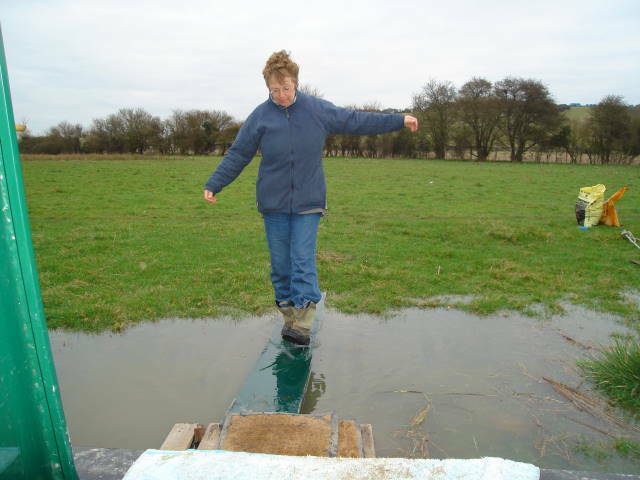 We sorted that out then it was on to the first of two swing bridges. A bright an early start. 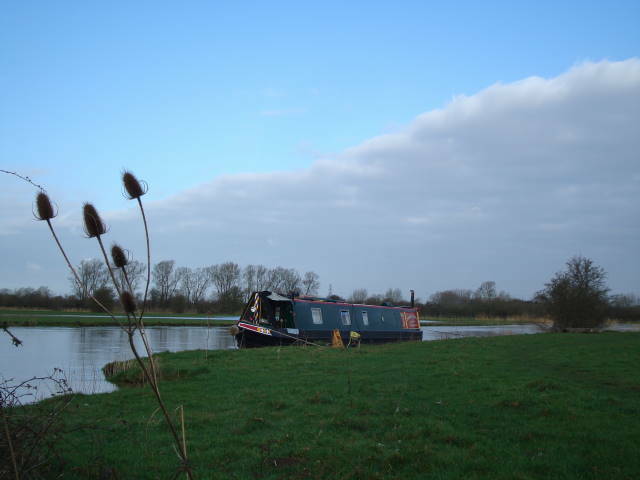 The forecast doesn’t look good so we are making a dash for the Barge Inn at Seend. Lovely sunshine though this morning, must be the calm before the storm. Arrived at the Barge at 10.30am. 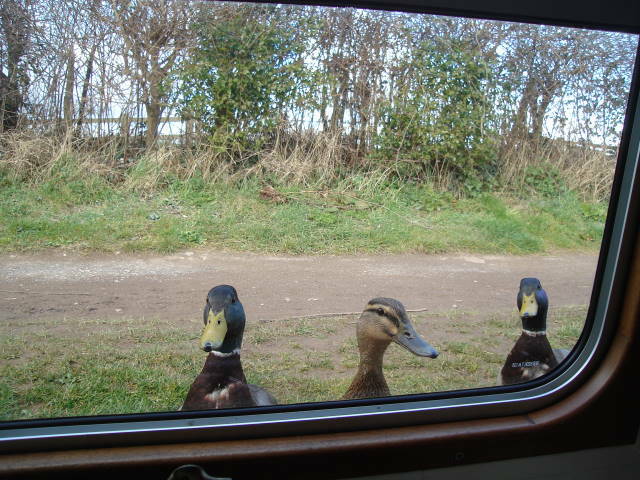 The local gang turned up to bully us out of some bread. They were very persistent and when we hid, they flew onto the roof and banged the glass of the Houdini hatch in the roof, just to let us know they could see us. Filled up with water and moored up Nik and Gemma’s boat right opposite the pub. They arrived at 7.30pm, and after unloading the car we moved to the pub to sample the local brew 6X – made in Devizes a few miles away. Nik and Paul managed a few pints! Gemma and I were a little more restrained. Gemma was recovering from a “girls weekend” in Sheffield. I didn’t have an excuse, I’m just past it. Battened down the hatches and prepared for a bumpy night. Nik Philips kindly picked us up in his van and ran us down from Eynsham to Bradford upon Avon, where we were to collect two broad beam boats. I worked with Nik’s partner Gemma last year, and they are giving Anglo Welsh a hand, to bring one of these two boats back to the base on the Thames above Oxford. Nik and Gemma have commitments over the weekend, so Paul and I are getting the boats ready and taking them single handed to a pub near the bottom of the Devizes flight of locks.After grabbing a bit of shopping from nearby Sainsbury’s and some oil for one of the engines, Paul and I set off. We only cruised a couple of hours and moored up at the bottom of a flight of locks at Semington. 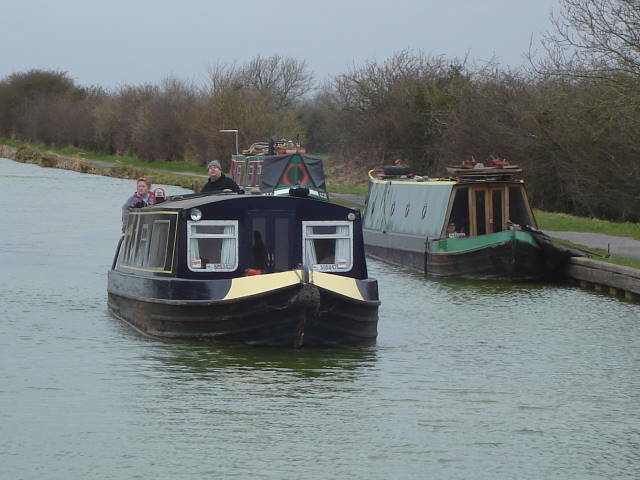 After a week of kicking around in Oxford, moored by Osney Lock, we brought our boat up to the Anglo yard at Eynsham. No room at the Inn, so we moored up in the field next to the marina. What a fabulous mooring. Lovely fields for Pip to run around in, and when the weather warms up a great spot for bar-b-ques.Only slight worry, there are high winds forecasted for the weekend. Will the boat be OK? Moored up at Osney lock was just too good an opportunity to miss catching up with Sarah and Stuart. They turned up with their bikes and a Chinese takeaway for a gossipy evening on the boat. Sarah has just recovered from being very poorly, and she and Stuart had an early start for work the next day, so we thought we better not overdo it on the boozing front. Should have known better…… after drinking the boat dry we adjourned to the Waterman’s Arms for beer and wine and a game of table billiards, that Paul won with a spectacular shot off the cushion.Then it was time to don the latest Oxford bicycle head gear and cycle home via the towpath along the river. PS. Yes they got back safely. You are currently browsing the Daniel Oakley blog archives for March, 2008.